Approximately 12 mini bags of Milkybar® Discs. 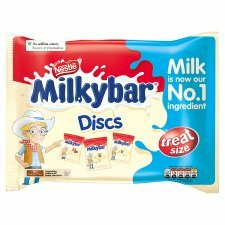 The pack designs for our Milkybar® Discs are especially fun - choose from a pig, cow, tractor, chicken or sheep pack, all full of great creamy-tasting, smooth white chocolate buttons. With no artificial colours, flavours or preservatives you can enjoy the delicious taste of Milkybar® in every white chocolate disc. Have you tried the Milkybar® Kid bar? Why not grab this creamy-tasting bar when you're on the go… did we mention it's shaped like the Milkybar Kid®?